Back in the 1990’s, before the European boilers became popular, just about all boiler installations were traditional USA-made cast iron boilers. As you can imagine, there are thousands of these boilers throughout the Massachusetts. It is scary but true- even today many heating contractors install boilers without fully understanding proper piping procedures. Virtually all American boiler manufacturers ship their boilers with the circulator mounted on the return. Does that mean it should stay there? No way! Call Gary, he’ll explain why most heating contractors are mistaken with the ole “this is how I was taught to do it and it works just fine” routine. Wilson routinely re-pipes boiler systems that were installed according to standards that became outdated years ago. We mostly install hot water boilers, but steam boilers are no stranger to us either. As Dan Holohan says, “Steam was king” back in the early 20th century, and there are plenty of steam boilers replaced every year. Dan is a recognized authority on steam heating. Ironically enough, what would seem to be the easiest heating system to update (after all, how much technology is needed to boil water? ), the opposite is quite true. There is a distinct difference in a heating contractor who knows how to pipe a modern steam boiler, and one who does not. 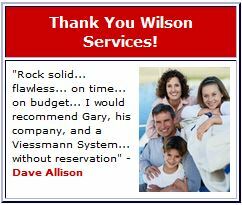 Wilson has many customers who can attest to this fact, because they paid us to re-pipe their steam boilers after the original heating contract failed to install it properly. A home owner may say, “well, the local inspector came and passed it, it must be all set”. You would be sadly mistaken, because the inspector is only required to focus on the fuel connection, the venting of the appliance and the water connection, and also to ensure the safety devices are in place. The inspector very likely will not fail an installation due to any ‘distribution’ related concerns. European radiators are becoming more and more popular in our country. Unlike conventional hot water baseboard installations and (especially) warm air heating, these units provide approximately 60% radiant heat. Radiant heat is what we feel when we stand in the sun, what we’re feeling is actual rays of heat beaming at us. This makes for a much more comfortable system, which also means the temperature can be lowered a little, thus saving even more fuel. For example, we may feel chilly on a 65F day with overcast, however if the sun is out, we may very comfortable in this weather. They also can be much more efficient due to the fact that they produce heat with very mild water temperatures in the fall and spring seasons. Installed in conjunction with an “outdoor reset control”, these heating units are the most efficient means of heating, next to floor radiant heating. Unlike a conventional baseboard system, this type of heating system can be adjusted at every room. This can be very economical when certain areas of the home are not always being occupied. Other reasons to consider the European style radiator are their durability. Unlike the thin sheet metal used with baseboard units, these radiators are very durable. Also they can be installed anywhere in the bathroom. Most baseboard systems are installed on outside walls. When the baseboards are installed next to toilets, they tend to rust within several years. They also are available in many different sizes allowing for one large heater or several small units to heat the various rooms in the home. Most average-sized rooms require only one radiator. If you are looking for a Heating Installation Contractor in Massachusetts then please call us today at 413-584-3317 or complete our our online request form.